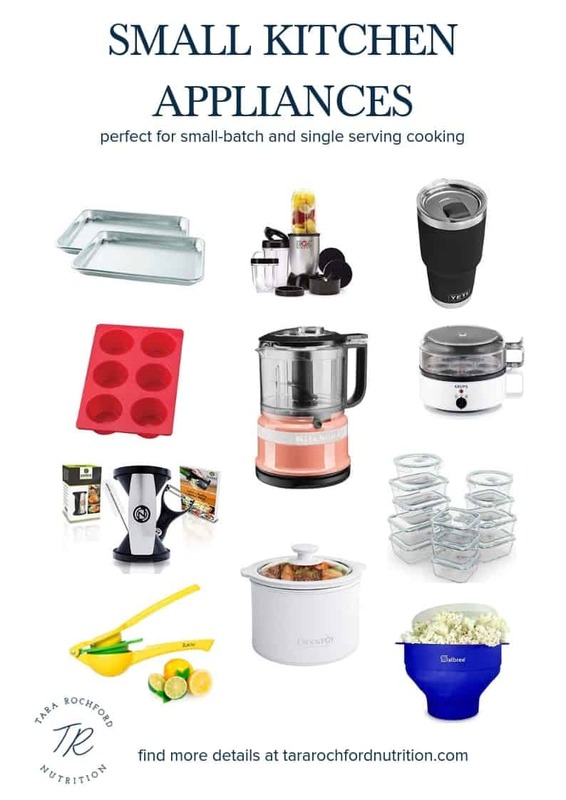 This list of Small Kitchen Appliances is perfect for college students, people in apartments, or anyone that makes small-batch or single serving meals. Pin this list of Small Kitchen Appliances here! After a wonderful winter break, class is back in session at Butler University! Tuesday is my day on campus, so I met with students and faculty/staff members that had appointments and started working on some events I am planning for the semester. A topic that comes up a lot with my college students that live on campus in apartments or seniors who are getting ready to graduate are SMALL KITCHEN APPLIANCES. This is a list of small kitchen appliances I have compiled that will make cooking single serving or small-batch meals at home a dream! This post contains affiliate links. Thank you for your constant support! If you haven’t experimented with the crock-pot or slow cooker, you are truly missing out. Simply put fresh ingredients in the slow cooker and allow it to work all day long. We cook a slow cooker meal about once a week! The 1.5 qt size is perfect for serving 1-2 people. Blenders can be used for smoothies, salad dressing, finely chopping vegetables, creating purees, etc. The size of the Magic Bullet is perfect for making enough for one or two people and doesn’t require a ton of room to store while at the same time it still has enough power to really blend things until they are smooth! I have tried my fair share of mini blenders, but I always come back to the Magic Bullet. While some of the duties of the food processor and the Magic Bullet overlap, things like homemade hummus, pesto, and nut butters are easier to make in a food processor. This may not be necessary for everyone, but I use mine on a regular basis so thought I would include it. I use my Yeti tumbler every day and everywhere I go. It has the ability to keep hot drinks hot, but I’ll be completely honest in saying I only use mine to drink ice cold water. The small size is absolutely perfect for small-batch baking and single or double serving cooking. 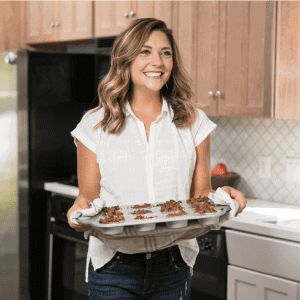 This muffin pan comes in handy for my Healthy Homemade Freezer Breakfast Sandwich, Oatmeal Blueberry Carrot Zucchini Muffins (cut the recipe in half), or any other recipe calling for a muffin tin. The silicone makes it super easy to clean! I love these handheld spiral vegetable slicers because they are super easy to store and clean. Of course, things are a little more involved and it feels a bit more like an arm workout, but before investing in a spiral attachment for my kitchenaid stand mixer, this is all I used and my spiral vegetable dishes turned out great! Once you have chopped and cooked your food, you need something to store it in! I love having glass storage containers in a variety of sizes to pack in lunch boxes and for storing leftovers. This item isn’t a kitchen necessity, but it is one of my favorite kitchen tools! It’s a microwave popcorn popper that requires zero oil. I love that I can totally be in control of the flavor and seasonings that go on the popcorn I eat. Makes delicious popcorn! I have joked several times that this is my absolute favorite kitchen appliance! I didn’t start using this tool until a couple of years ago, but it is a game changer if you are juicing your own citrus. It prevents seeds from getting into the juice and really gets all the juice out of the fruit. What is one kitchen appliance you can’t live without?